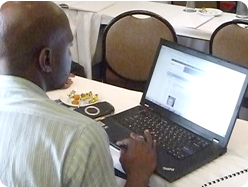 Enterprise Fundi is an online database of information to help small business. It’s full of up-to-date guides that help your clients set up and run businesses. It saves you time by making useful information available to you in one place. Access to Enterprise Fundi is by subscription. You pay an annual fee for unlimited access to the information – all updates and new additions are automatically available to you. Spend more time advising clients, and less time researching – call today on 084 645 4635 for a one-month free trial. How often does a client come into your office seeking basic advice or guidance on a specific business that they are thinking about starting – or for advice and ideas about what kind of business they could start? The Enterprise Fundi range of Businesses You Can Start guides helps you respond quickly to client information requests. You won’t need to spend hours researching – just search the online Enterprise Fundi database, select the guides that are relevant and print them for your client to take away, read and put into action. The range of guides is continually updated and expanded to reflect trends and changes in the local economy and national regulations. You’ll always have access to the most up-to-date information for your clients. For small businesses that are starting and operating, there are many challenges that bring new business owners into your office for advice. Many entrepreneurs come in looking for finance but, as their advisers, you often discover that they need more than money to succeed. How To Run Your Business guides are a quick and effective solution for those everyday tasks that your small business clients need to quickly grasp. Once you’ve explained to them what they need, you can print out the relevant guide from the Enterprise Fundi database. They leave your office with one or more of these down-to-earth guides to gain the know-how they are seeking. The range of guides covers the most common areas that small businesses need to think about. They include information on sales and marketing, cash flow, office management, employment and much more. For small businesses, it is vital to understand which market sectors offer the most opportunities, and what the trends are for future growth. The problem is, most market intelligence is expensive, and is written for economists; our SA Market Summaries are not. The Summaries bring together – in an easy-to-read format – the important aspects of South Africa’s main economic sectors. They will give your clients a good start when trying to understand the market for their business idea, and when making proposals for funding. Get all the business information you need, all in one place – call today on 084 645 4635 for a one-month free trial. Enterprise Fundi is a valuable source of information that helps us provide practical and focused support to our clients. It saves me research time while empowering entrepreneurs and small businesses with knowledge. Join over subscribers saving time on research – call today on 084 645 4635 for a one-month free trial.